In conjunction with our sister site, Born Offside, we have been given 3 copies of Next Goal Wins on DVD to give away. The documentary tells the story of the American Samoan national team, the victims of the heaviest ever defeat in international football, 31-0 to Australia, and at one point the worst national team in the game, as they look to achieve their first ever win. In what position are American Samoa in the current FIFA World Rankings? The competition will close at 11pm on Tuesday the 2nd of September when the winners will be chosen at random. 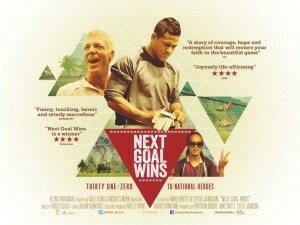 Next Goal Wins is out on DVD to buy from Monday the 1st September. Keep your eye on Failed Critics for an interview with the American Samoa goalkeeper Nicky Salapu. In the meantime, you can read our interview with the film’s director Steve Jamison, listen to our podcast review of Next Goal Wins, or read the written interview from back in May.